It should be noted that throughout this area, the presence of “lights” and “vehicles” is so common that on several occasion, local residents contacted CEUFO to witness the maneuvers of “strange vehicles” that are even visible over the area during the daytime hours – a region that is being scourged by a remarkable drought. The eyewitness accounts include those by police officers and community authorities of the southern communities, who have come to consider the phenomenon as folklore. 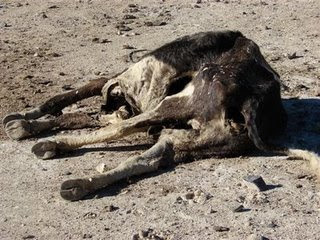 Cattle mutilations have re-entered the conversations of livestock producers and residents of various regions of La Pampa and central Argentina in general. Every so often, almost cyclically, the subject of mutilated animals, slain with alarming precision, appears once more in the media, especially in the nation’s heartland. La Pampa takes center stage and a wide array of comments emerge from discussions at coffeehouses, cattlemen’s’ associations, and all the towns in Argentina’s central region. Memories of the “rodents” in the absurd essay produced by SENASA are a source of amusement among seasoned laborers, knowledgeable of the strange manifestations in their area. And within this framework, the term “extraterrestrial” causes an uncomfortable sensation among those who have witnessed the maneuvers of strange lights in the darkness, generally associated to the mysterious and unknown. Long-time rural residents marvel at the precision of the cuts, and are even more startled that other creatures refuse to approach animals slain in this fashion. It is only now that carrion animals are timidly starting to approach a carcass that has lain exposed for ten to twelve days. 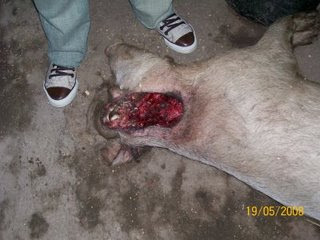 A veteran farmer stated, “The lacerations are not normal. There are no signs that the animal even tried to fend off an assailant. Rather, it appears to have fallen asleep on the ground. Within this framework of hundreds of episodes taking place over a vast central region of the country, some agencies endeavored to prove that the events were “natural” and blamed the “red-muzzled mouse”, but were unaware that scientists know the region well by virtue of living in it, and also know all of its nooks and crannies and each species that occupies them. These scientists vehemently dismissed the laboratory-confected assays. Finally, the DEFINITIVE report, which was not circulated at all, was the one furnished to CEUFO by an official with the School of Veterinary Medicine of the University of La Pampa. After a year of experiments and comparisons, they ruled that THE INCISIONS WERE MECHANICAL – that is to say, produced by an element having nothing to do with the teeth of rodents or carrion animals. The question arose immediately – Was this what caused the animals to stampede? Was it in any way connected with the mutilations? We can draw our own conclusions with all of this information.